WASHINGTON • China is expected to add substantial military infrastructure, including surveillance systems, to artificial islands in the South China Sea this year, giving it long-term "civil-military bases" in the contested waters, according to the Pentagon. 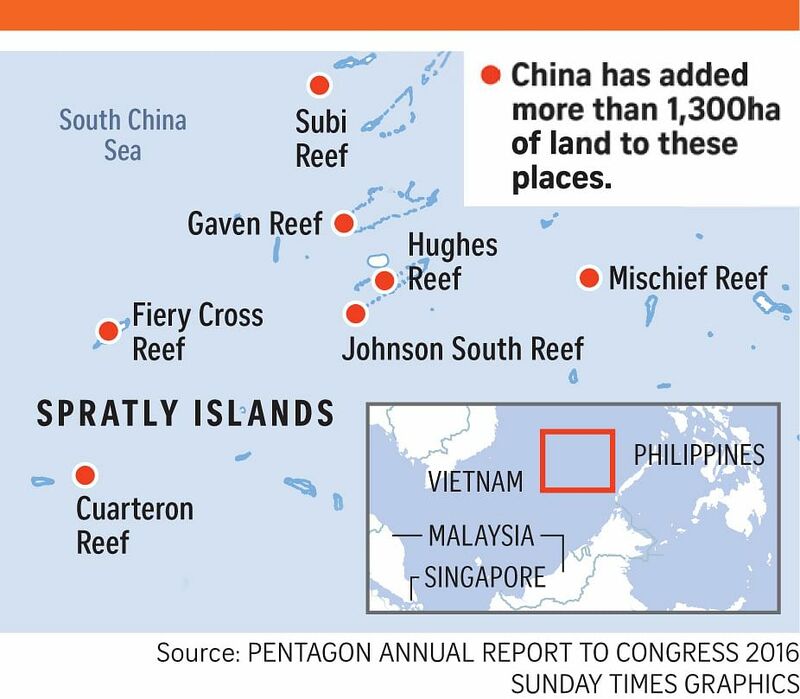 In its annual report to Congress on China's military activities last year, the US Defence Department estimated that China's reclamation work had added more than 1,300ha of land on seven features it occupied in the Spratly Islands in the space of two years. "Additional substantial infrastructure, including communications and surveillance systems, is expected to be built on these features in the coming year," it said on Friday. The report comes at a time of heightened tension over maritime territories claimed by China and disputed by several Asian nations. Washington has accused Beijing of militarising the South China Sea while Beijing, in turn, has criticised increased US naval patrols and exercises in Asia. The report said China was focusing on developing capabilities to counter outside intervention in any conflict, but appeared to want to avoid direct confrontation with the United States in Asia, given the potential economic damage. Gen Dunford's spokesman, Captain Greg Hicks, said in a statement that both sides agreed the talks, which took place via video conference last Thursday, were a valuable way to "manage both cooperative and contentious issues, and avoid miscalculation". The Pentagon's report cautioned that China was committed to sustaining growth in defence spending even as its economic growth cools, and to pursuing objectives increasingly distant from China's shores. Mr Abraham Denmark, Deputy Assistant Secretary of Defence for East Asia, told a briefing that China's 2015 defence spending was higher than it publicly disclosed and had reached US$180 billion (S$247 billion), compared with an official declaration of US$144 billion. The US report renewed accusations against China's government and military for cyber attacks against US government computer systems, a charge Beijing denies. It said that the attacks last year appeared focused on intelligence collection. "Targeted information could inform Chinese military planners' work to build a picture of US defence networks, logistics and related military capabilities that could be exploited during a crisis," the report said.